With several natural disasters that have been devastating our Earth it's top of mind as to how we can all do our part. 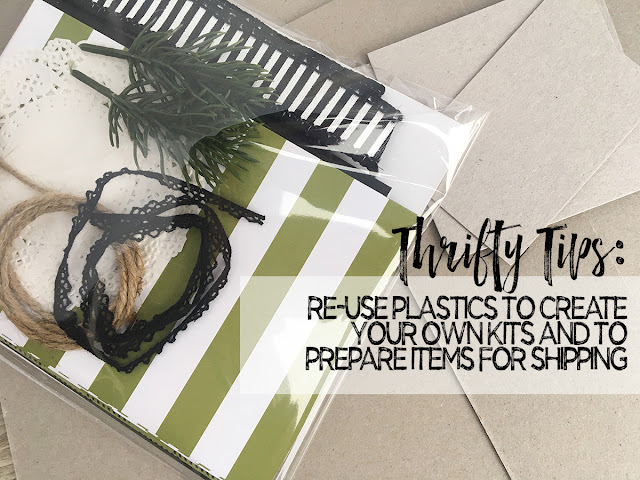 Today's blog hop is about finding ways to be thrifty and to use what you have. While, I do many things to stretch my dollar re-using my packaging is a consistent thing that I do. THRIFTY TIP:Re-use the cardboard included in paper products. 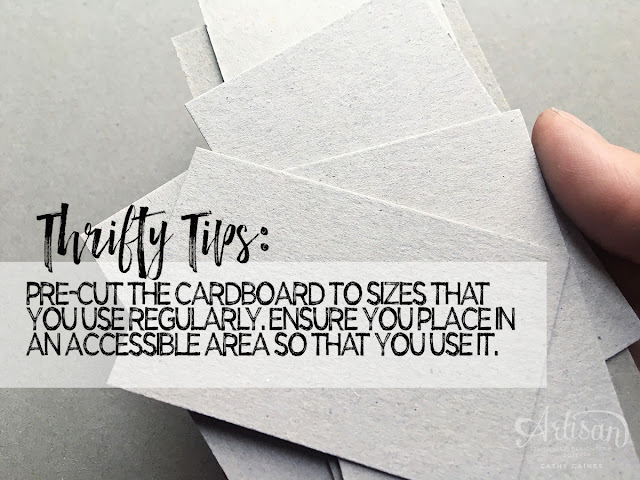 Use the cardboard by pre-cutting the cardboard and placing it in an accessible spot in your craft room. Depending on my projects, I often cut it to 5.25" x 4" - this size is perfect for standard card sizes. Right now I am doing a lot of tags so I cut the pieces down to fit those sizes this week. I also re-use the plastics included in the packaging. No matter the size, I re-use the packaging for many reasons. Currently, I am creating product shares as a Stampin' Up! demonstrator. I re-use the little baggies and containers as much as I can. I also use the cardboard to keep the items sturdy for shipping. In the photo below, the plastic is an old thinlets package. There are so many things that we can do but maybe you'll think twice when you go to throw out your packaging next time. Keep learning and click 'next' to check out Jennifer Frost's thrifty ideas. I can't wait to see your creation - everything you do is just gorgeous!! Fantastic tip Cathy! I also have a stash on bags and card from SU packaging because I can't bear to thrown them out but until now I've not found a use for them. what a fantastic presentation of great tips! I really enjoyed reading your post. Hope to read more of you. Thanks Cathy, I must admit I have been saving my card for some time, I usually use it for posting packages, I never thought to use it on cards or for scrapbooking. My mind is ticking. 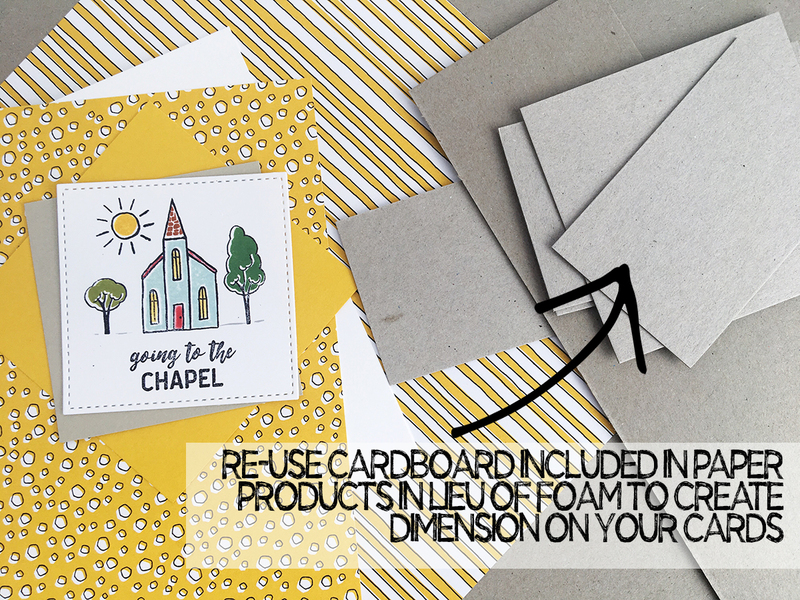 Also I just wanted to mention that some plastics are great as substitutes for window sheets,the plastic that our dies come in work well for smaller shaker cards. I just saved a plastic die case for making die cut ornaments...packaging can be pretty too so I try to save those bits. I love your card!